Aetiolo& Usually a complication of advanced periodontitis. It may be due to injury to the pocket floor (?food-packing) or more virulent infection. 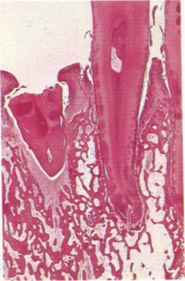 Pathology • Rapid acceleration of periodontal destruction. • Destruction of epithelial pocket lining. 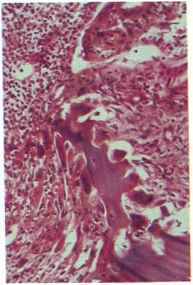 • Dense neutrophil infiltrate and suppuration (Fig. 43). 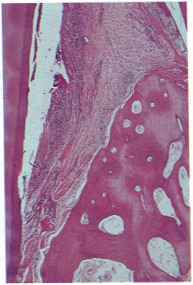 • Widespread osteoclastic resorption of bone (Fig. 44) increasing width and depth of pocket to form deep intrabony pocket. • Pus may exude from pocket mouth or point on attached gingiva. Fig 41 Late periodontitis with intrabony pocket. Fig. 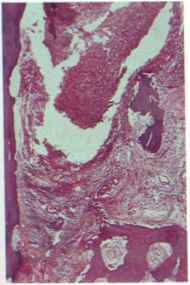 42 Higher power view of intrabony pocket. Fig. 44 Giant cete resofbing bony floor of periodontal abscess.